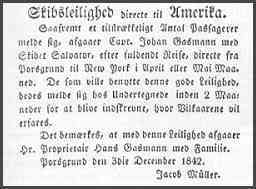 Please visit my homepage "Skien Genealogical Page"
It all started in 1843. They had probably heard about America for some years, as farmers had left Tinn parish already in 1837. The growing America-fever met with great concern from The authorities. 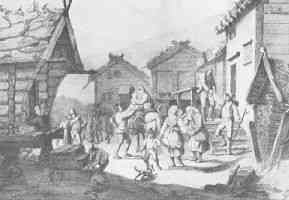 A report was already sent to the Treasury department in 1837, as a result of the leaving of the first group from Telemark. But they soon realised that with reference to the law, they could not stop the emigration. So the authorities restricted themselves to dissuading people from leaving, as they emphasised the great difficulties one would certainly meet in those distant and alien countries. "Nordre Foss" in Gjerpen, Hans Gasmann, made it public through the newspapers, that he intended to emigrate to America with his entire family, wife and 13 children. (kommerselester), equal to 326 gross reg. tons, sailed out the fjord on May 12, and two months later, on July 13, the first emigrants from Gjerpen set foot on American soil in New York. Here you will find passenger-lists for the vessels "Skien", "Rjukan", "Nordhavet" and "Tamworth", which left with emigrants for Quebec and Montreal in Canada in the years 1866 - 1873. Lots of names from all over Telemark. I have tried to collect bits and pieces about the emigration from my part of Norway and display it on a year-by-year sort of system. It's a bit incoherent, but I hope you'll excuse it. I am adding information along the way. as I come across it. The information comes from old newspapers, especially "Skiensposten" and "Bratsberg Amts Correspondent", and also some interesting things have been found in various books and articles written on this subject. I'd like to emphasise a couple of books in English, which describe the conditions for the early Gjerpen-emigrants extremely well, and also where you will find more information on many farms and families. "A history of Iola, Wisconsin" by Robert M. Poeschl, issued 1978 has interesting facts about Gjerpen-farms as Bestul, Frogner and Løberg. Choose a year........and search through the names. These lists of names are taken mostly from the parish records of Gjerpen. Some additional names have been found in articles and books. The dates given in the lists are not the day they emigrated, but the day the attestation is given by the vicar. One needed a traveller-passport ("reisepass") in order to emigrate or settle in another parish or county. This passport was normally issued by the vicar or by the police-authorities. maybe you are one of the descendants........then please....contribute to this site by letting me include that info here. ...............and various old newspapers, census-returns, church-registers on microfilm, particularly the old issues of "Bratsberg-Amts Correspondent" from the 1840's, "Skiensposten" from 1842-43, "Ukeblad for Skien og Omegn" from 1837, and "Correspondenten" from the 1850's and 60's.